A silent film is a film with no accompanying, synchronized recorded spoken dialogue. The technology for silent films was invented around 1860, but remained a novelty until around 1880 - 1900, when films on a single reel became easily produced. The idea of combining motion pictures with recorded sound is nearly as old as the motion picture itself, but because of the technical challenges involved, most films were silent before the late 1920s. But the silent picture was a universal language through its messages. The silent film era is sometimes referred to as the "Age of the Silver Screen". The years before sound came to the movies are known as the silent era among film scholars and historians. The art of motion pictures grew into full maturity before silent films were replaced by talking pictures or talkies and many film buffs believe the aesthetic quality of cinema decreased for several years as the new medium of sound was adapted to the movies. The visual quality of silent movies (especially those produced during the 1920s) was often extremely high but later televised presentations of poor, second or even third generation copies made from already damaged and neglected stock (usually played back at incorrect speeds and with inappropriate music) led to the widely held misconception that these films were primitive and barely watchable by modern standards. Since silent films had no synchronized sound for dialogue, onscreen intertitles were used to narrate story points, present key dialogue and sometimes even comment on the action for the cinema audience. The title writer became a key professional in silent film and was often separate from the scenario writer who created the story. Intertitles (or titles as they were generally called at the time) often became graphic elements themselves, featuring illustrations or abstract decorations that commented on the action of the film or enhanced its atmosphere. Showings of silent films almost always featured live music, starting with the pianist at the first public projection of movies by the Lumière Brothers on December 28, 1895 in Paris (Cook, 1990). From the beginning, music was recognized as essential, contributing to the atmosphere and giving the audience vital emotional cues (musicians sometimes played on film sets during shooting for similar reasons). Small town and neighbourhood movie theaters usually had a pianist. From the mid-teens onward, large city theaters tended to have organists or entire orchestras. Massive theatrical organs such as the famous "mighty Wurlitzer" could simulate some orchestral sounds along with a number of sound effects. The scores for silents were often more or less improvised early in the medium's history. Once full features became commonplace, however, music was compiled from Photoplay music by the pianist, organist, orchestra conductor or the movie studio itself, which would send out a cue sheet with the film. Starting with mostly original score composed by Joseph Carl Breil for D.W. Griffith's groundbreaking epic The Birth of a Nation (USA, 1915) it became relatively common for films to arrive at the exhibiting theatre with original, specially composed scores (Eyman, 1997). By the height of the silent era, movies were the single largest source of employment for instrumental musicians (at least in America) and the introduction of talkies, which happened simultaneously with the onset of the Great Depression, was devastating. Film industries in some countries devised other ways of bringing sound to silents. The early cinema of Brazil featured fitas cantatas, filmed operettas with singers lip-synching behind the screen (Parkinson, 1995, p. 69). In Japan, films had not only live music, but the benshi, a live narrator who provided commentary and character voices. The benshi became a central element in Japanese film form, as well as providing translation for foreign (mostly American) movies (Standish, 2005). Their popularity was one reason why silents persisted well into the 1930s in Japan. Few film scores have survived intact from this period, and musicologists are still confronted by questions in attempting a precise reconstruction of those which remain. For this reason, it is important to distinguish what types of score are being shown with a film. They can be either complete reconstructions, newly composed for the occasion, assembled from already existing music libraries or even improvised if necessary. Critical in the development of the silent score is the Theater Organ which, as a 'one man unit-orchestra' had a serious impact both on the configuration and size of theatre orchestras in the period (used for doubling parts or entire sections) and was also able to provide the entire score complete with foley thanks to a wide range of special effects, actual percussion instruments and a large battery of orchestrally voiced organ pipes. Specialists in the art of arranging and performing silent film scores are rare today. Steven Ball of Ann Arbor's Michigan Theatre is one such performer who is still employed as the Staff Organist in a silent movie house. Also among the ranks are Rosa Rio (organist at the Brooklyn Fox during the silent era and now at the Tampa Theatre), Ben Model, Neil Brand, Phillip C. Carli, Jon Mirsalis, Dennis James and Donald Sosin -- creating and performing live musical scores on piano or theatre organ. Other composers such as Carl Davis have specialized in writing new orchestral scores for silent classics. The medium of silent film required a great emphasis on body language and facial expression so the audience could better understand what an actor was feeling and portraying on screen. The gesticulations common to much silent film acting are apt to strike modern-day audiences as simplistic or campy. For this reason, silent comedies tend to be more popular in the modern era than drama, partly because overacting is more natural in comedy. However, some silent films were quite subtly acted, depending on the director and the skill of the actors. Overacting in silent films was sometimes a habit actors transferred from their stage experience and directors who understood the intimacy of the new medium discouraged it. As stated by the jaded Norma Desmond in Sunset Boulevard as she watches one of her silent films, "We didn't need voices; we had faces." Up until around 1925, most silent films were shot at slower speeds (or "frame rates") than sound films, typically at 16 to 23 frames per second depending on the year and studio, rather than 24 frames per second. Unless carefully shown at their original speeds they can appear unnaturally fast and jerky, which reinforces their alien appearance to modern viewers. At the same time, some scenes were intentionally undercranked during shooting in order to accelerate the action, particularly in the case of slapstick comedies. The intended frame rate of a silent film can be ambiguous and since they were usually hand cranked there can even be variation within one film. Film speed is often a vexed issue among scholars and film buffs in the presentation of silents today, especially when it comes to DVD releases of "restored" films; the 2002 restoration of Metropolis (Germany, 1927) may be the most fiercely debated example. Projectionists frequently showed silent films at speeds which were slightly faster than the rate at which they were shot. Most films seem to have been shown at 18 fps or higher - some even faster than what would become sound film speed (24 fps). Even if shot at 16 fps (often cited as "silent speed"), the projection of a nitrate base 35mm film at such a slow speed carried a considerable risk of fire. Oftentimes projectionists would receive instructions from the distributors as to how fast particular reels or scenes should be projected on the musical director's cue sheet. Theaters also sometimes varied their projection speeds depending on the time of day or popularity of a film in order to maximize profit. Thousands of silent films were made during the years before the introduction of sound, but some historians estimate between 80 and 90 percent of them have been lost forever. Movies of the first half of the 20th century were filmed on an unstable, highly flammable nitrate film stock which required careful preservation to keep it from decomposing over time. Most of these films were considered to have no commercial value after they were shown in theaters and were carelessly preserved if at all. Over the decades their prints crumbled into dust (or goo). Many were recycled and a sizable number were destroyed in both studio fires and space-saving projects. As a result, silent film preservation has been a high priority among movie historians. Several filmmakers have paid homage to the comedies of the silent era, including Jacques Tati with his Les Vacances de Monsieur Hulot (1953), Mel Brooks with Silent Movie (1976) and indie filmmaker Eric B. Borgman with his film The Deserter (2004). Taiwanese director Hou Hsiao-Hsien's acclaimed drama Three Times (2005) is during its middle third a silent, complete with intertitles; Stanley Tucci's The Impostors has an opening silent sequence in the style of early silent comedies. The style is also echoed in the 1999 German film Tuvalu. Guy Maddin won awards for his homage to Soviet era silent films for his short The Heart of the World. Shadow of the Vampire (2000) is a highly fictionalized depiction of the filming of Friedrich Wilhelm Murnau's classic silent vampire movie Nosferatu (1922). 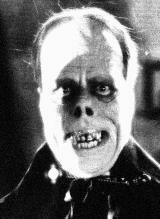 Werner Herzog honored the same film in his own version, Nosferatu: Phantom der Nacht (1979). Some films draw a direct contrast between the silent film era and the era of talkies. Sunset Blvd. shows the disconnect between the two eras in the character of Norma Desmond, played by silent film star Gloria Swanson. Although attempts to create sync-sound motion pictures go back to the Edison lab in 1896, the technology only became well-developed in the early 1920's. The next few years were a race to design, implement, and market several rival sound-on-disc and sound-on-film sound formats. Although The Jazz Singer's release in 1927 marked the first commercially successful sound film, silent films formed the majority of features produced in both 1927 and 1928. Thus the modern sound film era may be regarded as coming to dominance beginning in 1929. For a listing of notable silent era films, see list of years in film for the years between the beginning of film and 1928. The following list only includes films produced in the sound era with the specific artistic intention of being silent. These films have survived in film archives or have been found in private collections.